Kristine is the author of the amazing book “Heart Broken Open”, as well as the author of several books in the “Don’t Sweat the Small Stuff” book series. She is also the wife of the late Richard Carlson, author of the original “Don’t Sweat the Small Stuff” book. 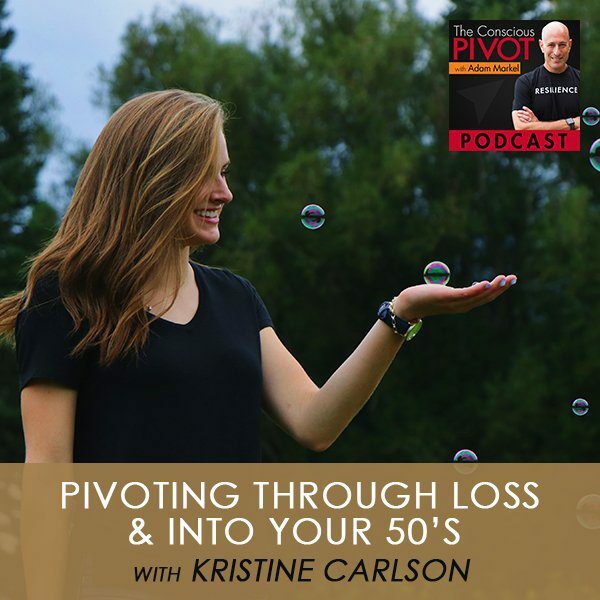 In our podcast, Kristine shares how she pivoted through loss and learned to become present by the process she calls “allowing”. In this spiritually uplifting and insightful interview, Kristine and I discuss, among other things, how people are addicted to activity as a way of feeling more secure, and how to escape that trap by loving life even more. Kristine Carlson is a writer, a speaker, and a catalyst of change. Her hope is to be a guide and an inspiration to you as you navigate your way through the challenges life presents. This year marks the 20th anniversary of the “Don’t Sweat the Small Stuff” series. To learn more about the anniversary celebration, visit www.KristineCarlson.com. We have an incredible guest for our show. Kristine Carlson, you are an amazing person. I want you to share with our guests a little bit about yourself. I don’t typically like to read introductions, it’s not my favorite thing to do. I don’t even like when people read mine. I prefer to hear about you from you. The first thing I would love you to know is I had my fourth grandbaby so I’m a nana. My kids don’t call me grandma, they call me Nana. Probably the greatest joy in the entire universe is to have grandkids, and it’s such an honor and a privilege to play such a strong role in their lives. That’s been exciting news for me. If you knew me, you’d know that I’m the widow of Richard Carlson, the author of Don’t Sweat the Small Stuff. It’s all small stuff, although that would be my bone to pick with him that it isn’t all small stuff after all. I’ve had an amazing life and an amazing journey. I’ve been so richly blessed that focusing on the gratitude of everything that I’ve been given and all the blessings of my life has been what’s gotten me through the hard times. The measure of a great life is not just all the success that you have, or even it’s not measured by success or failure. It’s measured by how well we go through the hard times. I lost Richard about ten years ago suddenly to a pulmonary embolism. So many of his fans today, millions of them, still don’t even know that he has passed because his work is such a brilliant light in the world. That’s incredible and that Richard would smile knowing that his work has lived on. He always said the measure of a great business is one that you could walk away from and it still continues to move forward. His work has helped so many people and I hope that it helps the whole next generation of people. I very much see it as my position in life to help carry that forward. Along with that, I’ve written several other books and writing a new book. My books are a little, I don’t know want to say deeper, but they definitely are deep dive. They’re more about healing. They’re more about moving through loss, heartbreak and becoming whole and returning to joy. If you knew me, you’d know that I’m a joyful person. I love to laugh, I love to have fun, and this is a great time in our lives. We’re talking about being in our 50s. I don’t see being in my 50s as being a drawback at this point. I don’t have PMS anymore. I am so much nicer and more even tempered. Richard would love to be married to me now. It’s such a productive time too. I find it to be a wonderful time in life. I hope anybody who’s in their 50s feels the same way. It’s an amazing time of reinvention. That’s what I’ve been doing lately, just working with people and helping them discover their life passion and be more vibrant and be healthy through all the ups and downs of life. There’s a series of pivots. It’s the name of the show. We explore this concept of pivoting, of reinventing and doing it consciously versus being in reaction. I’m diving deep into The Presence Process, this book by Michael Brown. It’s absolutely beautiful to explore that distinction between reaction and response, and the ability to respond in consciously managing and utilizing the change that is ever present. It’s one of those great constants in life that things are continually evolving and continually changing. Change is something that people fear. I’ve had fear and issues around change and disruption, especially when it’s not planned. Clearly, you had a major disruption of your life plan. You had a good plan. You were working a good plan. You’re married to a man you love and having a great life, and he’s doing work that has a legacy impact, has a historical offering, as Fernando Flores was sharing with us at ATL. In the midst of all that, something changes drastically and dramatically in an instant. You have to pivot, you have to change. There’s a shift that occurs. How did you handle that? My guess is that that’s also a part where you help people to heal themselves and to integrate their life experiences so that they can be productive now, whether they’re in their 30s, 40s, 50s, 60s or wherever they might be. The ability to live fully now and in the present is a big deal. You talk about becoming more responsive to life and that’s reactive. If you look at the Don’t Sweat the Small Stuff books and the wisdom in those books, they point to mindfulness. They point to being responsive to life and less reactive. Certainly, the tools that you gain by practicing your life like that help you practice life when you have to do a large pivot turn, when life shatters. There are two things that people always ask me. Can you prepare for a loss? Can you prepare for a change? I always say, “Loss in and of itself is like childbirth. You can do everything right and then you get to that birthing day, and you just don’t know how that birth is going to go. It’s going to be different for everyone and it’s going to be different each child. Every loss that you go through, you’re going to probably go through that loss and go through that change slightly differently than you did before. How you practice life on a day-to-day basis, the level of presence that you practice, the emotional well-being tools that you have in your tool belt that you practice, how centered and calm you are in your life on a day-to-day basis, all of these things play a huge role when life does shatter and when something happens that is unexpected. You refer to all of those tools that you have in your tool belt to make that pivot turn, to be able to stand in those circumstances. I love Randy Pausch‘s work so much in the last part of his life when he said that we can’t control the hand that we’re dealt, but we can play the hand that’s dealt us. That’s where we have power and control, and we can combat any change with an empowered stand. The one thing that I identified for myself very early on was that I had two choices. There were only two for me. I could be a victim of these circumstances or I could stand up and walk the hero’s journey and live what I was given. I refer to this in my introduction, just saying that for me, I was so blessed. My life had already, in the 25 years that I had known Richard, changed so much. It was such a bigger expression of life than I ever could have planned or anticipated for my own life. It was a bigger dream that I held with him than I could have ever dreamed up on my own, and maybe even for him. We always felt like instruments of the divine, instruments of pure heart and love, and that we were being played. Inspiration would come to him and come to me and we would play with it, in a way, because we offered ourselves to it. I continued to do that throughout my loss. I continued to offer myself to spirit and to be guided and to be loved in grace, and to heal and to allow grief and loss to do its work on me. I wasn’t one to jump ship because it was painful. I wanted to know that this loss counted for as much as this life had and it did. It awakened me, and it shaped and shifted me into a completely new woman in a lot of ways. The measure of a great life is not just all the success that you have or failure. It’s measured by how well we go through the hard times. It is one of the things that I definitely didn’t notice at earlier stages of life. The people in our community, there’s a lot of millennials. There are people that are in various stages. I know at an earlier stage in my own development, I didn’t realize how important resilience was. Now it’s part of the Pivot recipe, our formula. Resilience is so impactful. It sounds like you developed a recipe for being resilient in the midst of all that disruption, chaos, grief and loss. Referring to presence, what I realized too is that when I would spend any time in my past, there are these stages of grief that you go through. You can refer to Elisabeth Kübler-Ross’s work, although I never felt I would go through them and be done with them. I felt like I was all over the map with them. In the beginning, I remember feeling that if I look back it’s so painful because I wish I could have stopped what happened. I wish I had known or seen something that would have indicated Richard’s health wasn’t the way we thought it was. He died from a pulmonary embolism on a flight to New York on the descent of that flight. It’s like having a blood clot, an aneurysm, that just explodes and he died instantly. There wasn’t probably a lot of warning for him or anything, and certainly no warning us. If I spent time thinking about my past, there’s an incredible pain, and if I went into my future in that time period, I was also in incredible pain and a lot of fear. I learned to bring my attention and my thoughts back into the present moment. I looked at it like a vertical alignment. “I’m aligning with spirit in this moment, and in this moment I feel pretty good. In this moment I can find joy, I can be healthy, I can even be still.” There’s a lot of peace in the present moment for me during that first year especially. At the end of that first year, I thought, “What a miracle.” Oprah always said that Richard was the one that taught her how to be present in her life. I always thought that I was pretty present, but when I practiced presence and grief, then I understood what true presence was. It was beautiful because it gave me that whole year to practice presence as a mode of upright to survive. That was what it was about; it was surviving that first year. For anybody who’s going through loss or has a great fear of loss, we’re geared. Honestly, we’re geared to go through these things. You don’t have to be afraid. If you can stay more present in your life, you’ll be okay, you will. You’ll go through it. At some point, you will wake up one day and life will feel much more normal again. That’s certainly what happened to me. I look at whether it’s that type of a loss or it’s the sudden loss of a job that can feel like your life has gotten turned upside down or it’s a business that you’ve invested so much of your love and time and energy into, like it’s a family member or a baby. Sometimes those businesses don’t go well either and you lose that. Resilience is so key. For me, there are three things that are a must. One is that you take whatever the circumstance, the situation is, and you frame it differently, because you frame it as something that is awful. I can see this beautiful tree. I’m looking at that tree and I see that there are maybe some leaves or what have you, but it looks to me like a tree of life. That’s the frame I’m putting that picture for myself. I could look at it and it could trigger, based on my history or my past, maybe even traumatic experiences. I could look at that tree and frame it very differently. It could bring up a memory of a past loss or hurt or something, but that’s not how I’m seeing that tree. I’m seeing that tree as a tree of life or something that’s going to bear fruit and goes through seasons, and leaves will fall and then they’ll grow back. It’s this beautiful, strong, organic, connected divine thing that’s the essence of life itself. That’s a framing for something like that. That’s the same thing with every area of our life. We can put it in a frame and choose what will be within the borders of that frame. We are framing the experience in a positive way. Then moving to the stage of, “What have I learned?” You learned so much through the grieving process. You learned so much from being in relationship with Richard, from all of the things that happened before his death. Then you learned so much as a result of his death, including what you just said, which is that you learn the true meaning of presence. Heartbroken Open: The only way out was going to be going all the way in. It’s incredible that life itself is the best teacher. The third piece to me, of our resilience recipe, is our ability to take care of ourselves. People get the first two, “I get it. I’ve got to re-frame this thing. I can’t look at whatever’s going on as the end of the world. I know I can learn whatever is there for me.” They still don’t necessarily take care of themselves as a part of the recovery process, to be resilient, to be that willow tree that bends in the wind and doesn’t break and often comes back stronger. I’m curious whether you’ve had certain rituals that you’ve adopted to help you recover, the rituals that take care of you in body, mind and spirit. Would you share a few of those things? I want to say that initially, I knew intuitively that I needed to take care of myself through the early stages of grief, even the first couple of years. I remember the first year I didn’t even drink any alcohol because maybe there was a little bit of fear that I might become dependent on it to numb myself out. I knew intuitively and also from all of our years of study and personal study and personal growth work that it’d be too easy to try to numb out to that kind of pain. I knew that the only way out was going to be going all the way in. I also realized that I needed to get a lot of rest. I created a lot of space in my calendar. People tell you in grief to be busy, and I didn’t believe that was true. I believed that what I needed was stillness. What I needed was time in nature and time walking in the trees and being able to feel my feelings. I knew that to heal, I had to feel. There wasn’t going to be any other way through this for me. I spent a lot of time hiking with my dog. I didn’t exercise for the same reasons. I wasn’t exercising for fitness, although I have to say when I was in grief I probably look better than I’ve ever looked in my life because I was crying all the time, and crying is a huge immune system booster. It’s like a youth serum for some reason. I knew to do what I call supreme self-care. I meditated a lot. I would lay on my floor in stillness and allow grief to move through my body. Sometimes I would shake and I would cry. Sometimes I would scream. Sometimes I’d be laughing hysterically. There’s nothing that gets you through loss bigger than that love. The word allow was a big word for me. Being surrendered to what is, as opposed to me trying to make my life a certain way. I had felt like my life had completely shattered, but with that, I wasn’t holding the perfect life anymore. It was almost like, “Now I can be in this life.” I have allowed myself to rebirth in that way that we had far from the perfect life after Richard died. It looked pretty perfect and felt pretty perfect when he was alive. Those are some of the things I did. I took a lot of baths with Epsom salts, and found that very grounding. I spent time with people that were super nurturing to me. I did not spend time with people who weren’t. I don’t know if you remember your wife in childbirth, but she knew exactly what she needed when she wanted it and when she needed it. That’s what it’s like when you’re tuned in to yourself and you’re in a big life change. You get super clear on what it is that nourishes you and what it is that doesn’t. I was all about moving toward what was nourishing to me, because I also understood my body was going through a huge adrenal adjustment. A lot of energy was running through me to go through this loss. That’s the other part, people don’t understand that. When you’re going through a big change, your body has to be strong. There’s a body resilience that comes from you taking care of that body so that you can be the vehicle for that change. That’s the way I looked at it. You said something that I want to repeat so that people can hear it, which is that you became clear on how to take care of yourself in part. You created the space and the time to be able to focus, to allow for that to become an awareness for you, a present, then present moment awareness. Without that, if you’ve been in busy mode or been trying to do, do, do to get past something, you might not have taken care and might not have been guided to how it would be that you would take supreme care of yourself. Is that true for you? That’s true. If doing can be as much of an anesthesia, it’s a way of anesthetizing yourself as much as drinking alcohol or anything else. We can lose our ability to tune inward. I knew that creating stillness in my life was imperative for me to move through this loss. I couldn’t do it any other way. I always tell people, “Don’t over-busy yourself. Create some time and more spaciousness so that you can have the insights and the wisdom flow through you and into you.” With all of that creativity, I wrote a journal that year that became a book. It was called Heartbroken Open. This is my beautiful story of going through loss, and the awakening and the discovery of who I am, the discovery of self. It came through that loss. The only reason I was so tuned in to it was because I created that quiet time. I watched and I observed and I listened to my heart and my soul, and then I shared. It’s an incredible experience. You’re sitting on some of the most fertile ground of your life. If you think about that, it’s the worst time of your life, but it’s also one of the most incredible times. It’s not something we ever say, “Bring it. I want more of that.” It’s so incredible. It’s so incredibly rich. You and I, we connected probably the moment we sat down next to each other for the first time in that ATL meeting. It is so rich, that soil. It isn’t what we choose necessarily. Whether it’s God or spirit or whatever it is, it’s there for us in such a profound way. Thank you for those words. I want to state what you said in a bit of a different way, which is to say that people are addicted to activity. It’s that busyness that can take us away and even distract us from that richness of what’s going on in our lives. At any point, there are things happening in everybody’s life that are disruptive or bring up this great fear because there’s so much room for interpretation of it being not good. I want to restate the title of your book, Heartbroken Open, so that folks can obviously get it on Amazon or go into a bookstore. Is that the best way to get it? Interestingly, I’m going to re-publish it. I’m going to be writing a book called From Heartbreak to Wholeness. Heartbroken Open will come out again. It’s a little story that got orphaned when it was published. They asked me to rewrite it because they wanted more of a how to grieve book. It’s such a beautiful book and it’s helped so many people. I didn’t want to rewrite it to bring it out on paper books, so I said, “Could have the rights back?” I have the rights back now. I’m in the process of re-launching that book. It’s a beautiful guide, especially people that go through sudden loss or younger widows or younger widowers. I deal with a lot of the issues that younger people face in grief and loss like that than what people in their older years face. It’s a beautiful book. I’ve worked with a lot of widows, and I always say it’s like being a doula. You’re guiding them to birthing a new life and it’s painful. Transformation is messy. It’s very painful at times and it is chaotic, but if you know there’s going to be something great that comes from it and there’s hope, that’s the thing that gets people through it. It’s knowing that something great going to come out of it. I always say to people that I work with, “Your love of life has to be so much bigger.” It’s like loving God first. Your love of life is like loving God. It has to be so much bigger than any one success or anyone loss that you’ll ever have. When that happens and you can say, “I love life so much that I’m willing to return to joy and be in my life in the most joyous manner,” then that’s what loving God is all about. That’s what the expression of life is all about. There’s nothing that gets you through loss bigger than that love. You are also celebrating a twentieth anniversary, right? Thank you so much for being on my podcast too. That was such a wonderful conversation. It’s been twenty years since Richard wrote the first Don’t Sweat the Small Stuff book and 25 million copies have been sold worldwide, and even 5 million in the last ten years since his death. It’s pretty crazy and pretty awesome. We’re going to be celebrating it up. Thanks for mentioning that. I found the first Don’t Sweat the Small Stuff book. This one was about money. I remember where I was reading this and what my life was. I was a full-on workaholic, commuting into Manhattan to do this attorney work that I despised and knew I couldn’t do it forever. I came home one night, and I told Randi after having another one of those days. I came home late, I missed the kids going to sleep, and it was cold and rainy out. I walked to the door with my wool coat on. I looked at her and said, “If I don’t stop doing what I’m doing, you’re going to be a widow.” Those are my words to her. He tells a story that’s much more powerful. We knew then that a pivot, that a change, was something we wanted to create. This book was something that helped me through that time, because what was I thinking? I’m going, “I’m a lawyer, I got houses, cars, four kids, dogs, gerbils, goldfish. I know a lot of people and things that I’m responsible for.” This book gave me not just peace, but it also gave me the ability to be present and to think and to have clarity. This is a beautiful book. I love that we have become friends and that I’ve got to know you a bit. Thank you for joining us on this podcast. Thank you for being with us. I’m so happy about the relaunch of your book, that you’ve got the rights back to do that, the new project, the twentieth anniversary of Don’t Sweat the Small Stuff. All of it is so good. What a blessing to have you with us. Thank you. Thank you, Adam. It’s been wonderful. Have a great day. My Mom is still deeply grieving the loss of my Dad…her husband of 52 years. I feel like she has lost her sparkle and it is so encouraging to hear that Kristine has gotten so much of hers back! I love her advice on taking care of herself , being with people who nurture her, taking epsom salt baths and making time to just be still. Kristine your work is so important! Thank you! We so appreciate you taking the time to share some of your story with us Mary Ellen. So glad you found this podcast and got such value out of it. Thank you!